Our faculty members are working professionals with an average of 20 years of industry experience. 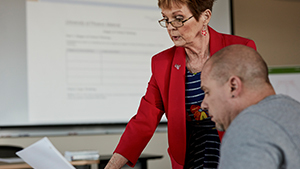 All Phoenix faculty members are working professionals with an advanced degree in the field they’re teaching. They turn theory into skills you can put into practice right away—after all, they know firsthand what works and what doesn’t. Our faculty members are here to share their real-world wisdom with you. They are some of the most interesting and knowledgeable people you’ll ever meet. More diverse than that of most institutions: the percentage of black professors is more than three times the national average. We believe a diverse faculty better serves the needs of a diverse student body—and we’re proud of all the backgrounds represented in the classroom. We try to prepare the students to apply the knowledge that they gain right away so they can improve and be more comfortable in the work they’re doing and be prepared for the future. Like our students, our faculty reflect a wide range of backgrounds and life experiences. They are elementary school principals, district attorneys, CEOs, counselors and organization presidents. They’ve worked for Fortune 1000 companies and local governments. Bringing their own valuable professional experience to the classroom, they share at least one thing in common: a commitment to career-focused education. More than just dedicated educators, some of our faculty also generates new knowledge and insights through their research. This scholarly work ensures that what you’re learning always reflects the latest and best thinking in the field. Teaching at Phoenix takes a special commitment. But the impact you have on students’ lives makes it all worthwhile. We want people who are ready to share their extensive work experience in the classroom.